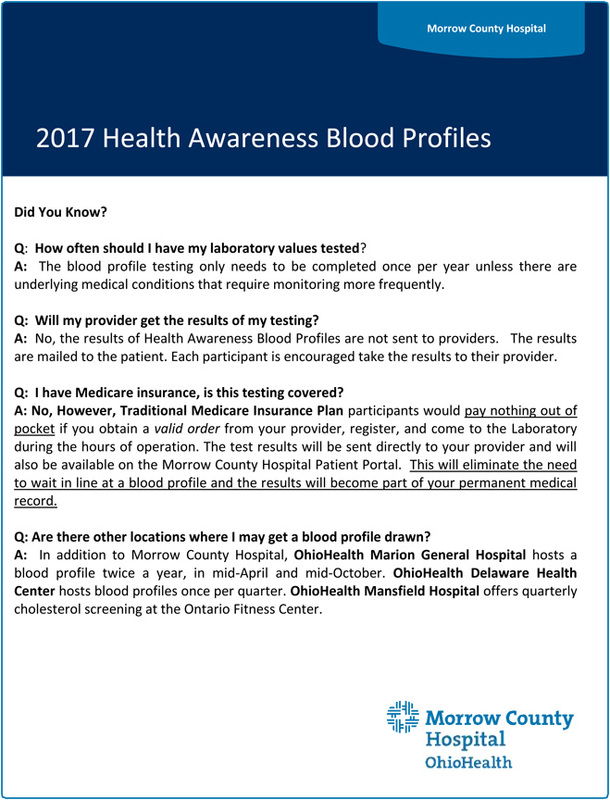 Morrow County Hospital’s Laboratory will offer $30 MCH Health Awareness blood profiles which will include a battery of 25 tests – cholesterol, triglycerides, HDL, LDL, VLDL, glucose, BUN (blood urea nitrogen), creatine, sodium, potassium, chloride, carbon dioxide, AST, ALT, total bilirubin, total protein, albumin, calcium, alkaline phosphatase, white blood count, red blood count, platelet count, hemoglobin/hematocrit, mean cell volume and mean cell hemoglobin concentration. + An 8- to 10-hour fast is necessary for accurate results – no eating. + Drink moderate amounts of water. + Take your medications with moderate amounts of water. No physicians’ orders for additional tests will be accepted at these screenings. These $30 blood profiles will only be available at Morrow County Hospital. Only cash or checks made payable to Morrow County Hospital will be accepted. No debit or credit cards. Questions? Contact (419) 949. 3089.